Since I don't start wearing gloves until mid December, my hands are always out on show and they feel the cold the most, therefore dry hands. 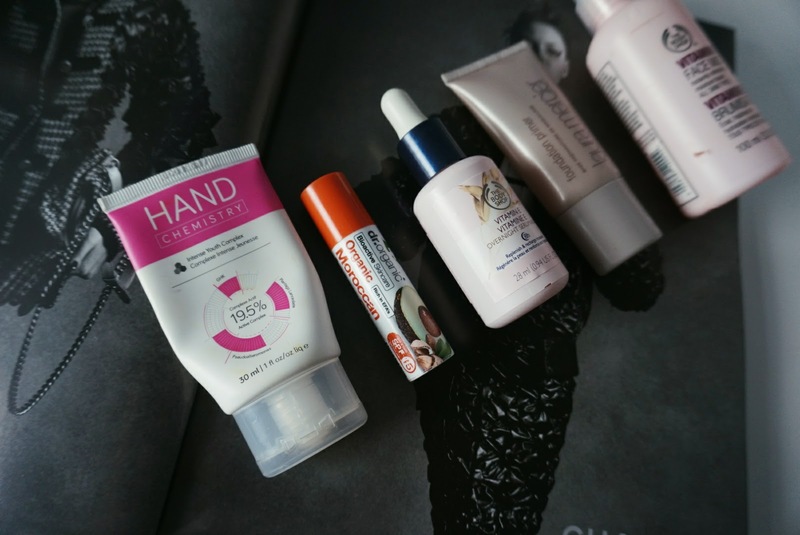 My favourite hand cream for quite a while now is the: HAND CHEMISTRY INTENSE YOUTH COMPLEX HAND CREAM, one off the best selling hand creams in Boots. You get hand creams that sink into the skin but does not fully soften and last throughout the day, but this one does, as soon as I apply the cream I feel the full effects; hydration, smoothness and texture and it smells amazing - like always I can't describe smells haha. For the lips, I love the DR ORGANIC MORROCAN ARGAN OIL LIP BALM, available from Holland & Baretts, it's a stick of Moroccan Argan oil, infused with avocado and almond in a tube that nourishes, hydrates and also contains SPF, I apply this morning and night, which leaves my lips chap-free. During the night, after cleansing and applying toner I use: THE BODY SHOP VITAMIN E OVERNIGHT SERUM-IN-OIL, a very well loved product of mine, I have gone through about 10 bottles since it came out. My skins feels extremely hydrated and more plump in the morning, creating a great base for my make-up. I always thought that applying oil on a oily based skin would not work, but I guess it just counter-reacts just like cleansing oils. Before applying foundation onto my skin, I use the LAURA MERCIER FOUNDATION PRIMER, which helps keep the hydration in your skin throughout the day, December and January is when I break this out since the wind is more harsh and nips the skin. I always come back to this and I have a lot of back-up in my skincare stash. 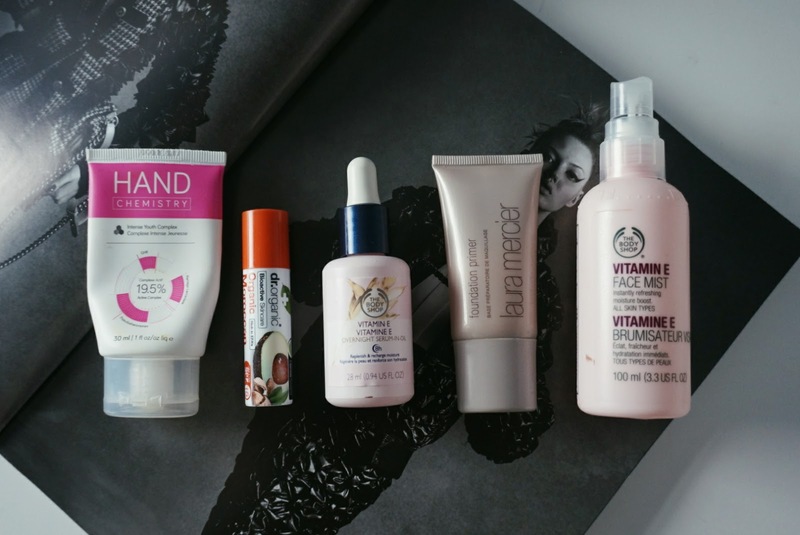 Lastly whenever my skin is feeling dry and flaky, or when I feel I need to set my make-up, I use THE BODY SHOP VITAMIN E FACE MIST, the fine mist instantly hydrates and makes my dry skin less flaky and also help keep my make-up at bay. This is something I keep in my handbag during Winter. What changes do you make to your skin? I've been experimenting with a few different things for the winter that won't break out my skin. I am loving the Eco Beauty Good Night Night Cream right now before bed. I LOVE the Body Shop's Vitamin E line. I used to use the overnight mask as my normal night cream. It's so lightweight, yet moisturizing! Love it! That Laura Mercier Primer is so good for this cold weather Very good tips! I loveee my Tarte Maracuja Oil. I mix it in with my moisturizer day and night. For hand cream, I just use a basic one by Nivea, but it leaves my skin so smooth until the next time I wash it off. I'm a total Body Shop convert! I avoided it for years for no real reason and now I have several staples from there in my bag. I adore the highlighters especially for this time of year. I tend to cover my face in highlighter to give a gorgeous glow despite lack of sleep or sunshine. I've heard alot of good things about the vitamin E serum but I'm yet to try it. I use jojoba oil at night which is perfect for oily skin because it matches the oil your skin produces and tricks it to produce less. I also love coconut oil on dry skin in the winter months! I should really take care of my skin better. It's just so hard to stick to a rutine. But thanks for the inspiration ! I've just started mine. Hope it turns out as amazing as yours. I love the mist idea! I may have to look into that! Thanks forsharing! That lip balm sounds awesome! Basic chapsticks just don't cut it for me in the winter!